Use this tutorial only when no other options helps to get Windows XP running without any problems and you don't want to format the drive. The back up of the data is the responsible of the user, however there is a description of how to do this.. 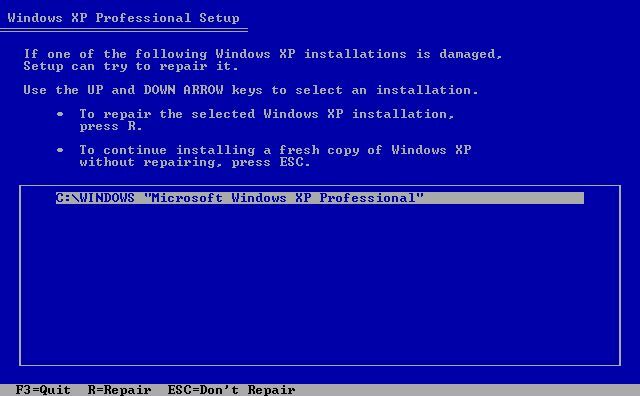 This tutorial will describe what you need to do in case you need to re install Windows XP on your computer. This is a most common procedure when Windows XP is not booting correctly or the Windows Registry is damaged and it is not able to repair it. Before you start to re install Windows, make sure that you have a back up of the data that you need. If you don't have a back up from your data on another drive that don't contain Windows (preferably an external drive). Then you can try the following program Redo Backup to make a back up of your files. You may need to ask some one else to burn this program to a CD. Boot from the CD to back up your data. The data that you need to back up is mostly found in the My Documents map located in the following map C;\Documents and Settings\<user name>\My Documents where the <user name> is the name of the user that you use to log in. If you have stored important data in another location than the My Documents map, make a copy of these data also. Most of the times you will still have the data after re-installing Windows XP, but in case the data is lossed use the back up to restore the data. If you need to install drivers for your raid controller or other I/O controllers make sure that you have them on a floppy, a CD or some other media. Most manufactures of Raid, SCSI and SATA controllers supply the drives together with the I/O card. You also need the drivers of your motherboard and the graphic card. To setup the PC for booting from CD, you can follow the instructions in the section 'How to change the start sequence in the bios' at the bottom of this article. Put the Windows XP CD in the CD / DVD player and boot from the CD. If you need to Install drivers for RAID, SCSI or SATA controller cards need to press F6, when it's displayed on the screen. It can take some time bfore the menu appears where you can select the drivers . If you don't need to install RAID, SCSI or SATA drivers do nothing. After reading the Windows XP License press F8 to continue. The wizard will detect that a previous version of windows if it Windows XP version on the CD matches with the one that is already installed on your PC. 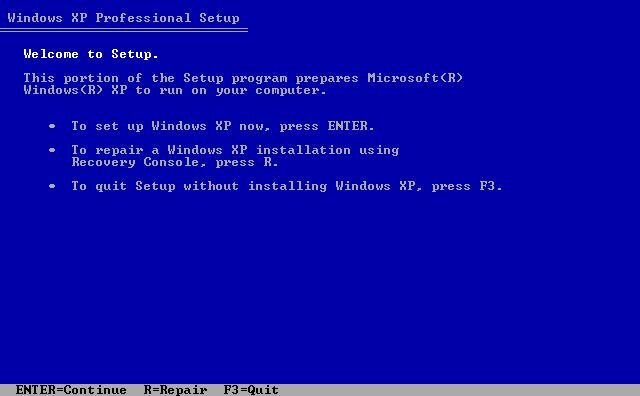 Choose option R "To repair the selected Windows XP installation". See the image named Windows Previous Installation. You may can get a warning from the set up wizard that a previous windows folder already exists. Press L to remove the folder and deleting the existing version. Proceed the rest of the installation as normal. When windows XP is started, you need to install the drivers for the motherboard, graphic cards and other devices again. This because the Windows Registry is complete build up again from the start. After installing the drivers you need to update Internet Explorer to version7. Below are instructions of how to do this. Check the My Documents map to verify that you have the data. If you had used the same user name during the installation as you had before performing the re-installation the date should be in the same map. If not you need to look in the map C:\Documents and Settings using the windows explorer look for the previous user name. If you open the previous user name you see the map named My Documents. Open this map to see if the data is in it. If the data is on that location you can copy the files from that location to your current My Documents map. It can happen that when you don't see the data you need to use the back up files. You also need to re-install all the other programs that you use, such as Office. Windows will be updating itself when connected to the Internet, since all the updates that where installed are removed. So if you have an CD with SP2 on it, windows will download SP3 and install it. 3. Look for the startup sequence settings (also known as boot sequence or boot order). You can usually use the arrow keys to move through the menus and settings. 4. When you find the startup sequence setting, you can usually press ENTER to modify it. Press the PLUS SIGN (+) or MINUS SIGN (-) key until the CD drive is selected as the startup disk. 5. As soon as you have specified the CD drive as the first location to search for a startup disk, you can usually press ESC to return to the menus. In the main menu, select the option SAVE AND EXIT SETUP or a similar option. When the confirmation SAVE TO CMOS AND EXIT or a similar option appears, select YES. 6. If you cannot select YES, type the letter y. 7. After you exit the BIOS setup, your computer will restart. 8. Make sure that the computer starts by using the CD drive. Insert the Windows XP installation CD and restart the computer. If this is successful, you can start reinstalling Windows XP. If you are not comfortable trying to perform this task, you may want to ask someone whom you know for help.